Please join us to enjoy calligraphy! We look forward to seeing you. 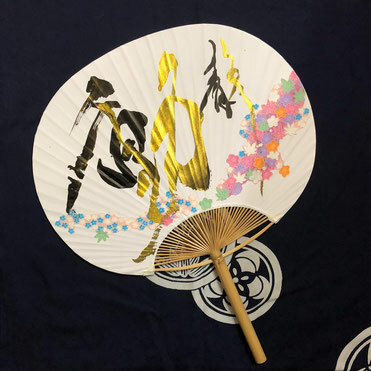 We are pleased to announce that Rihaku Inoue, a calligraphy artist, will hold a calligraphy demonstration and workshop at Setsugekka, themed “Draw your Summer” on uchiwa, a Japanese fan, with a writing brush. Based in Japan, Rihaku is active at numerous solo exhibitions, workshops, and demonstrations domestically and overseas, mainly in New York. 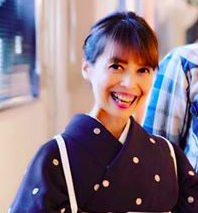 She is a consultant of the Japan Calligraphy Museum and a calligraphy professor of the Japan Education Calligraphy Federation. She held the 10th anniversary solo exhibition at Setsugekka in December, 2017. Rihaku creates a new type of Japanese calligraphy, in which she not only writes with a brush and ink but also incorporates color, such as acrylic paints. She produces her works to present the beauty of “Sho,” instant art, to the world. Japanese calligraphic art is commonly understood to be simply “writing,” but Rihaku believes that this art form is equal or superior to other visual and performing arts. Even if the audience has no knowledge of Japanese characters, she wants this contemporary Japanese calligraphy to stimulate the senses of people across the world, without borders, and reach out to their souls. This is the reason that she attempts to use more three-dimensional, active expressions. Rihaku has provided calligraphic designs to corporations, including label artwork for Japanese sake manufacturer Hakushika Sake. She has also designed wall artwork for a New York restaurant, and her wall art at a roadside rest area (Kasaoka Bay Farm) in Okayama Prefecture has been featured on television. Education: Konan Women’s University, in Kobe, Japan. Held her exhibition and workshop at Setsugekka East Village and performed live calligraphy demonstration at a gallery in Brooklyn. Held a solo exhibition and a workshop at KOSAKA Sushi Japanese Cuisine in NYC. Held a live performance on 2m sheet of Japanese washi paper for an opening at Brooklyn Beauty Fashion Labo in Brooklyn. Held a live performance on a 4.8m sheet of Japanese washi paper at a major social event for “Gastropolis Kobe”, a project newly launched by Kobe City to publicize Kobe’s food culture overseas leading up to 2020. Her design was selected as the logo for this Kobe City project. Held a double solo exhibition at the JICC (Japan Information and Culture Center) Gallery at the Embassy of Japan in Washington D.C., and a gallery in Manhattan, NY. Received high acclaim for her color-incorporating live calligraphy performance. Rihaku will perform calligraphy demonstration using a special brush to show you how to write characters. Then, you will decorate uchiwa, a Japanese fan, and write your theme of summer with a brush and ink. $55 per person Sold Out Thank you so much for joining!